Pacific Fire Exchange (PFX) continued to ramp up its ongoing effort to connect researchers and managers with a field tour of Puʻu Waʻawaʻa on Saturday, February 25. DLNR Division of Forestry and Wildlife (DOFAW) played host to over 35 participants, many of whom were involved in the conservation field in Hawaiʻi, including HWMO representatives, but even some who were just curious to learn more about the preserve and native dryland forests. The PFX Field Tour was a follow-up to the Nāhelehele Dry Forest Symposium, which was held the day before in Kailua-Kona. Leila Dudley, DOFAW, with Hualalai in the background, shares moʻolelo about Puʻu Waʻawaʻa and its surrounding areas. The tour kicked off at the Puʻu Waʻawaʻa Baseyard where hundreds of new native plant keiki were housed. After exploring the nursery, the group caravanned up to the Puʻu Waʻawaʻa Cinder Cone summit for a spectacular view of Hualālai, Mauna Loa, Mauna Kea, and the lands and ocean below it. Although the vog was particularly thick that day, we could still make out the outlines of the breathtaking giants that loomed over the cinder cone. Leilā Dudley, who works at the preserve with DOFAW, told an animated moʻolelo (history, tradition) about the connections between the place names and the people tied to them in North Kona. Clay Trauernicht, Co-Coordinator of PFX, shed light on the importance of understanding these stories in order to discuss proper management of these lands and the motivations behind the restoration and preservation of them. Puʻu Waʻawaʻa is the most diverse forest in Hawaiʻi and there are endless reasons for protecting and restoring the area. 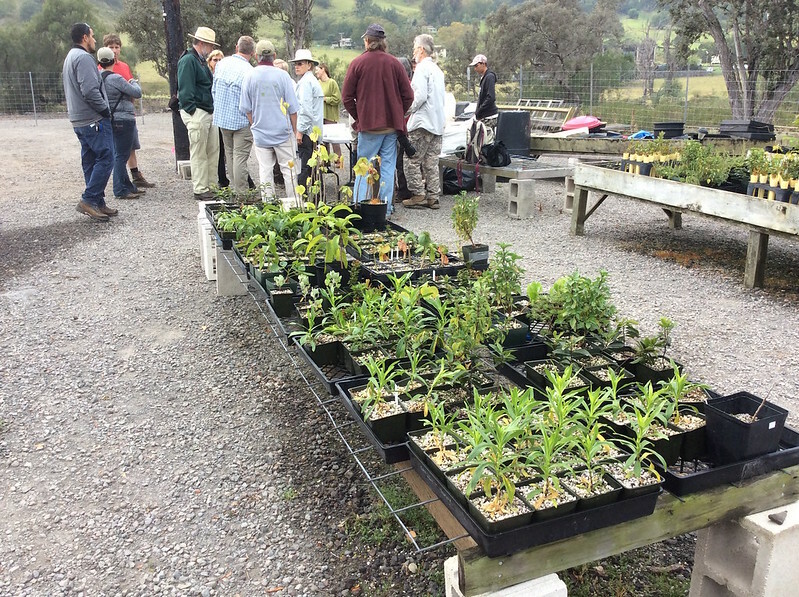 Wildfire has been a major driver of change for Puʻu Waʻawaʻa, and thus, the theme of the day was how to manage the landscape to keep wildfires at bay. Clay Trauernicht (right) and Chris Wada (second from right) share economic analyses in front of a koa restoration plot. At the next stop, the Waihou Exclosure, Elliott Parsons, DOFAW, gave background on the large koa restoration plot in the upper reaches of the forest preserve. Chris Wada, University of Hawaiʻi, entered the conversation with an economic analyses on the prioritization of areas for restoration in order to reduce landscape flammability and restore groundwater recharge. Lunch soon followed at the cool and misty Forest Bird Sanctuary (indeed, the chorus of bird songs was a highlight). HWMO’s Pablo Beimler shared a brief history of the organization’s work in the area — Puʻu Waʻawaʻa and its wildfire issues helped spur the creation of HWMO in the early 2000’s. Much of the lessons we had learned in Puʻu Waʻawaʻa are what we continue to carry with us as we expand our work statewide and into the Western Pacific. Field tour participants awestruck by the thriving native forest at Kīpuka Oweowe. After lunch, the group stopped at the 25 Mile Marker Road overlook to talk about valuation of landscapes and elevation gradients. We stopped midway down the final stretch of road to the highway to examine a stand of lama trees, Hawaiian persimmons that are endemic to Hawaiʻi. The plot the group stopped to look at was overgrown with dense and flammable grasses and shrubs, as well as invasive silver oaks. To contrast this plot, DOFAW led us to the final stop at the Kīpuka Oweowe dry forest restoration site. There, the tour participants gathered and then wandered off to explore the many native dryland plant delights. Careful and persistent management of fire fuels (mostly fountain grass) on the aʻaʻ lava flow, along with hours upon hours of volunteer help, has led to a thriving native forest reflective of what once covered the North Kona landscape. As we sampled the lama berries, honed in on uhiuhi flowers, and inquired about native rare plants we had never seen before, we were reminded of just how beautiful Hawaii’s native forests were and why we must continue to bring all stakeholders to the table to ensure the forests that do remain (or are being restored) are protected from wildfire. A big mahalo to Melissa Kunz and Clay Trauernicht and to the forest preserve staff of DOFAW for an incredible and worthwhile tour. We are sure the others in the group agree!